How many times does someone have to tell you something is killing you before you do something about it? Over the last year I have seen these articles. See a trend? "Sitting is KILLING you" - I thought the wording in these articles seemed a little overboard (or overkill... haw haw). My chair is out to murder me! All I can think of is a chair stabbing me repeatedly with a knife. It does get your attention though. In fact that was the approach this infographic took. Sitting personified as a villainous, deadly monster. "Prolonged sitting, meaning sitting for eight to 12 hours or more a day, increased your risk of developing type 2 diabetes by 90%." "A recent review of 43 studies analyzing daily activity and cancer rates found that people who reported sitting for more hours of the day had a 24% greater risk of developing colon cancer, a 32% higher risk of endometrial cancer and a 21% higher risk of lung cancer—regardless of how much they exercised." "...we sit an average of 9.3 hours a day, more than we spend sleeping. Scientists believe that anyone sitting more than 6 hours a day is at a heighten risk of developers problems and this much sitting may be as bad as smoking a pack of cigarettes everyday." "By reducing "excessive sitting" to less than three hours a day, the U.S. life expectancy could increase by two years, according to a July 2012 study in BMJ Open. Reducing TV time to less than two hours a day would bump it up by 1.4 years." " 6,379 people between the ages of 40 and 75 -- found that even controlling for physical activity and body mass index, those who sat less had lower risk of having chronic kidney disease." "People who sat more than 11 hours a day had a 40 percent higher risk of dying within three years." "Even if you stand stock-still, standing burns about 50 more calories per hour than sitting in front of your computer." "A 2012 study suggests that excessive inactivity is responsible for 6 percent of all cardiac disease, but also 7 percent of all type 2 diabetes, 10 percent of breast and colon cancers and 9 percent of all premature mortality." "Mayo researchers found that every hour you sit reduces the gains of your daily workout by eight percent. " 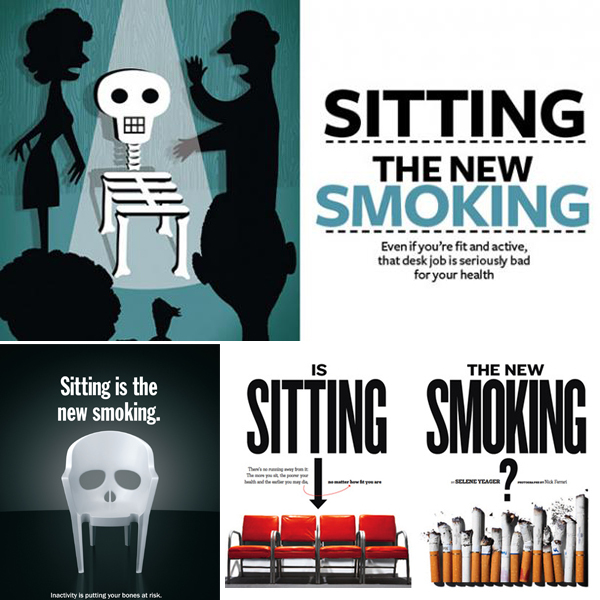 Yes, sitting is being compared to smoking! Again with the skull graphics. So what am I getting at here? I started thinking about this about a year ago. There is a die hard stander in my office and he got me thinking about giving it a try. I half heartedly stacked some paper reams and a foot rest on my desk and occasionally used my laptop on it. 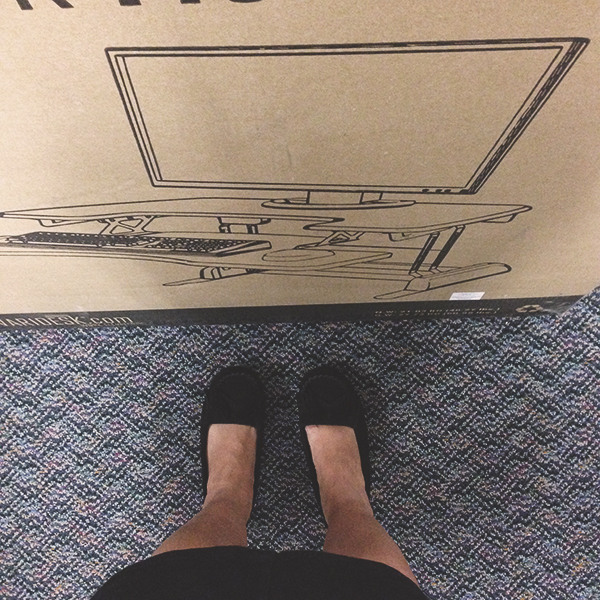 One by one, more people in my office started getting official standing desks in their cubicles. Suddenly my cobbled together standing desk looked inadequate. 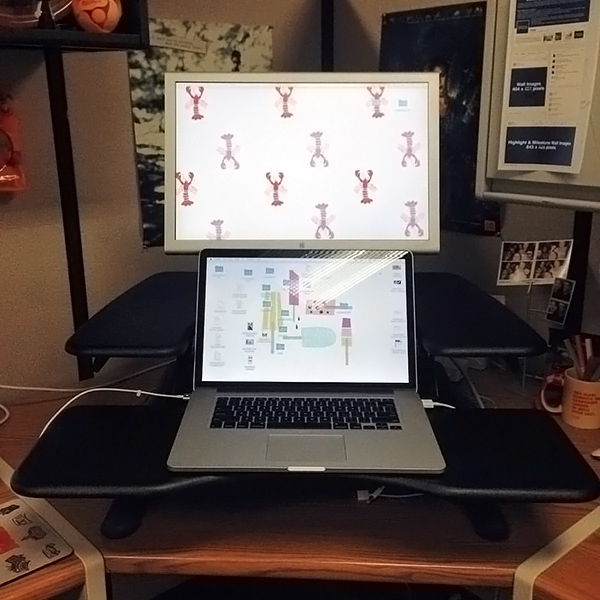 After months of my makeshift standing desk, I caved and requested a real standing desk. I was a little worried that I couldn't stand all day. Would I be able to concentrate? Would my back hurt? My standing desk collapses back to a sitting position but that looked like a pain to do. And from what I read, I needed to be all in. It's been a couple days, and I have to say it's not as hard as I thought it would be. The cushy floor mat is key, I think. I've never met anyone that got a standing desk that went back to sitting so that is encouraging. Who knows? Maybe next you will see me in one of these! 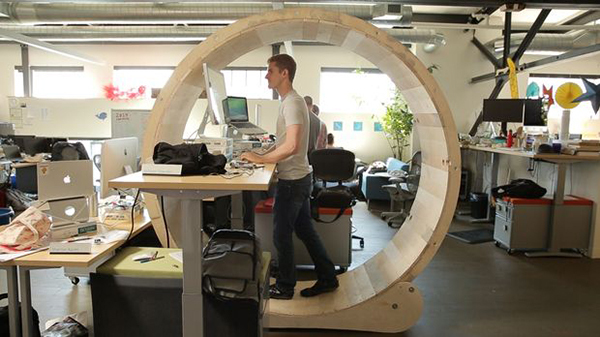 Of course there is always this (hilarious) option to achieve optimal health with standing and the office.